What is the best vape battery charger around right now? This is a great question, and it is one I get asked quite often. Both by readers of VapeBeat and friends and family. 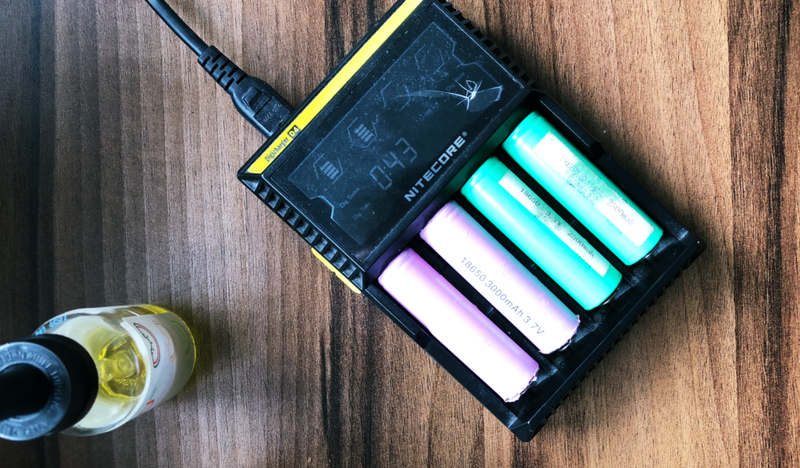 It is important because batteries can be dangerous when handled wrong, so you need to make sure you get a decent vape battery charger, as you don’t want any explosions or issues when charging you cells. Trust me: when it comes to batteries, it is ALWAYS best to play things safe (and pay a little extra, if necessary). I have always done this and, touch wood, I’ve never had any issues. If you’re anything like me, you’ll have a lot of 18650 battery cells laying around. I have, at last count, about 30, give or take 10%. For this reason, I made sure I invested in one of the best vape battery chargers around early on in my vaping days. What vape battery charger do I use? The NITECORE DigiCharger D4. I’ve had it for AGES and it’s got plenty of knocks and bruises, but she still works like a charm. The NITECORE DigiCharger D4 is great because, not only can it charge four cells at the same time, but it is also jam-packed with a myriad of safety features that will ensure everything is charged correctly, efficiently, and most importantly in a safe, controlled manner. If you insert them wrong, it won’t charge, if you battery is leaking or dangerous, it will not charge. Basically, if there is something wrong with your cells, the NITECORE DigiCharger D4 will pick it up and not put any power into them. There are more pricey options out there, but for me, the NITECORE DigiCharger D4 is basically exactly what most people will want– for me, it is the best vape battery charger around. It’s safe, cheap, runs like a dream, and, in four years of use, has not messed up once. [a[amazon box=”B00LZONPF2"]p>Mine is beat to S**T as well, see above, and it still keeps on trucking. I’ve taken it all over the world and it has never failed me. Not once. So if you’re in the market for the best vape battery charger money can buy, and you want something that’ll last you for years to come, you 100% want to check this one out.